The Reaver is the work-horse of the Ordo Ultima Thule. It has a modular construction that allows for easy configuration for different tasks; troop-carrier, assault-craft, cargo-hauler, and VIP-transport are but some. One of the great advantages of the Reaver is it's capability to travel both in atmosphere as well as in the Void. The cylindrical cargo/troop compartment can be lifted off and replaced, according to need. The load-grapples slung beneath the hull are capable of lifting heavy loads, but can also be used to lower, or extract, troops. If configured as a troop carrier, it can carry 20 troops, as a cargo-hauler, it can lift 6,500 kg. The vessel gains flight through buoyancy -- it's keel-beam is made of Levitanium, a Primordial metal that is lighter than air. Due to this, it is held to be almost impossible to crash. It is propelled by a Deichmar-Blitz Triebwerk 7 dieselkraft engine, and military models are also equipped with a Class II goethic reactor. 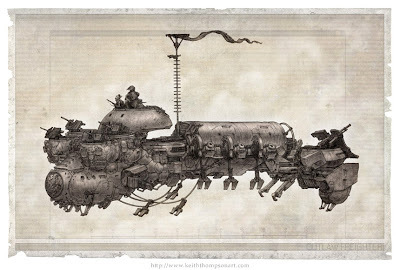 The latter provides energy for the Zauberschirm anti-magic field, the Maulwurf detection-system, as well as for the various other goethic devices carried by these vessels. The normal crew of a Reaver is nine, a pilot, an engineer, a commander, and 6 gunners. Standard armament consists of four 6.66 mm machine-guns, and one 30 mm automatic cannon. Isn't Keith Thompson awesome? Great write-up, by the way. Thanks. Thompson is one of my favourite artists. I have lost count of how many of his images I've used to illustrate my posts. I'm going to drive that thing to work, thank you. That'd probably make your delinquent Changeling neighbour think twice before giving you the stink eye. Very cool and nice reference link.